Overcoming interruptions from harsh winter weather earlier this year, U.S. employers regained their stride in March and added workers at a moderate pace. The expansion of payrolls affirms that the U.S. economy is charting a steady rate of growth and assures that the Federal Reserve will remain committed to its pledge of tapering its stimulus program. The labor market should build momentum during the coming months and accelerate growth to add 2.7 million jobs this year. U.S. employers hired 192,000 workers in March, and revisions to the preceding two months lifted job growth in the first quarter to 533,000 positions. Factories trimmed payrolls and government staffing was flat, but all other employment sectors added workers last month. One-half of the 57,000 positions added in the professional and business services sector were attributable to growth at temporary employment agencies. The termination of long-term unemployment benefits last December will spur temporary hiring over the next several months. In addition, trade, transportation and utilities establishments hired 38,000 workers last month, primarily in retail, as additional store openings generated new positions. 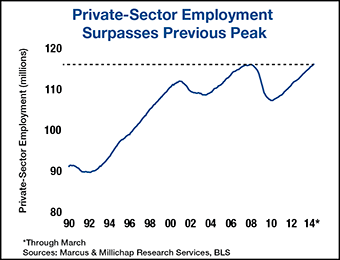 Private-sector payrolls have recovered their prior peak, as approximately 8.9 million workers have been added since hiring resumed in 2010. Professional and business services staffing accounts for more than one-quarter of the gain, and several relatively small employment sectors have also made disproportionately large contributions. Natural resources and mining, which includes oil and gas activities, added 224,000 jobs, accounting for 2.5 percent of the increase over the past four years despite the sector representing less than 1 percent of total private employment. The leisure and hospitality sector contributed 18 percent of all private-sector jobs added, despite only accounting for 12.5 percent of total private-sector payrolls. The gain principally occurred in bar and restaurants, which often bring customers to shopping centers and also expands the universe of single-tenant concepts for investors. The primary office-using employment sectors have recovered all of the jobs lost during the recession, positioning the national office sector for a vigorous recovery. Tenant expansions and new businesses will generate an increase in occupied space this year in excess of 2 percent, yielding a 120-basis point drop in vacancy to 14.8 percent. Rents are also on pace to rise 3.5 percent, with more significant growth projected as vacancy tumbles. Much of the increase in construction payrolls last month occurred in residential construction. A considerable portion of residential building is occurring in the multifamily segment, and developers are on pace to bring online 215,000 apartments this year. The increase in supply will exceed a projected rise in demand, leading to a 20-basis point uptick in national vacancy to a still-tight 5.2 percent. This entry was written by marcusmillichap, posted on April 4, 2014 at 9:56 pm, filed under Research and tagged Commercial Real Estate. Bookmark the permalink. Follow any comments here with the RSS feed for this post. Post a comment or leave a trackback: Trackback URL. According to the article, the private sector has fully recovered from the recession, so hiring will continue to increase throughout the year. This is great news for job seekers in the United States, and using every source to find employment is very important.